Ukulele Sakonnet got her soundboard installed today. 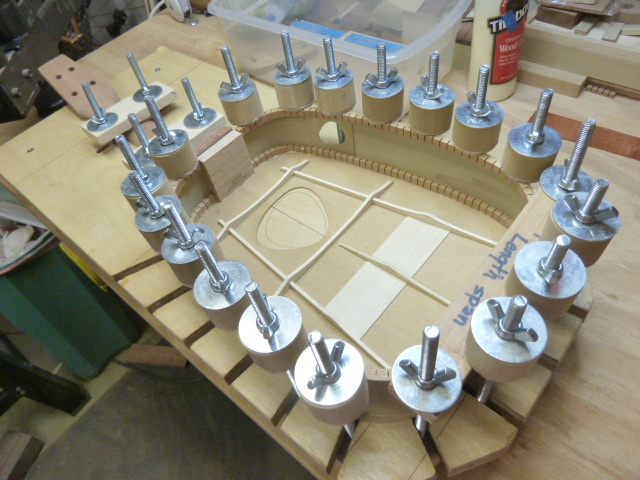 We cut her ‘wobbly’ soundhole, installed her bracing and her soundboard is in place. Next we’re actually going to apply some finish to the inside. Since “Sakonnet’ may be subjected to some unusual changes in humidity we’re going to add a bit of moisture protection to the inside. 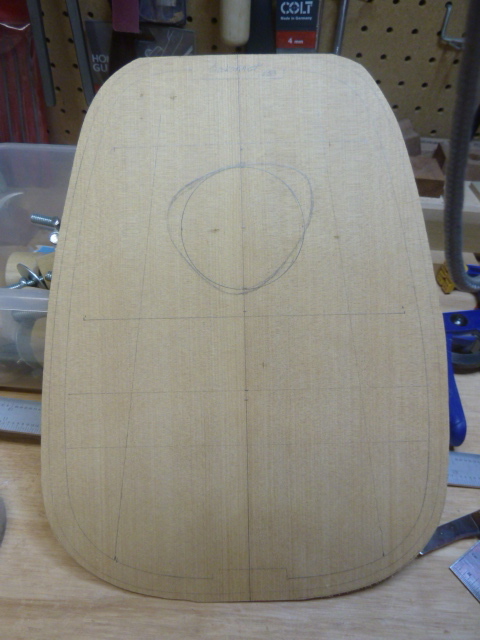 With her bracing mapped out and her soundhole sketched, Sakonnet’s golden Kauri sound board is ready for bracing. With braces and bridge plate installed, “Sakonnet” is trussed up tight in our solera to attach her golden Kauri soundboard. So as we said, we’ll add some finish to the inside and install her pickup. Then brace her back and close her up. Ukulele Sakonnet is actually fairly well along. 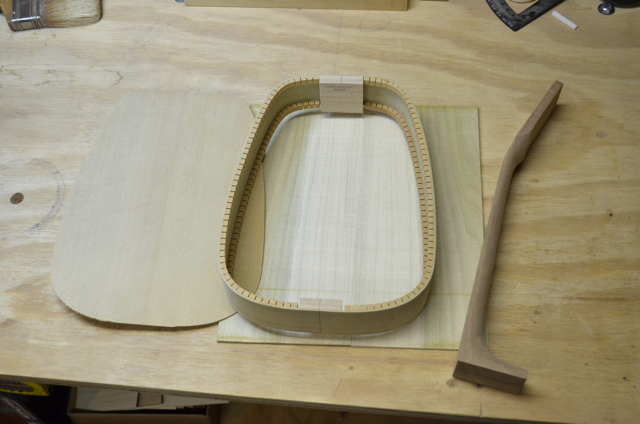 We’ve bent her ribs, glued in end blocks and kerfing, planed and trimmed her golden Kauri soundboard and Poplar backboard and shaped her neck. She looks a bit like a kit at this point. 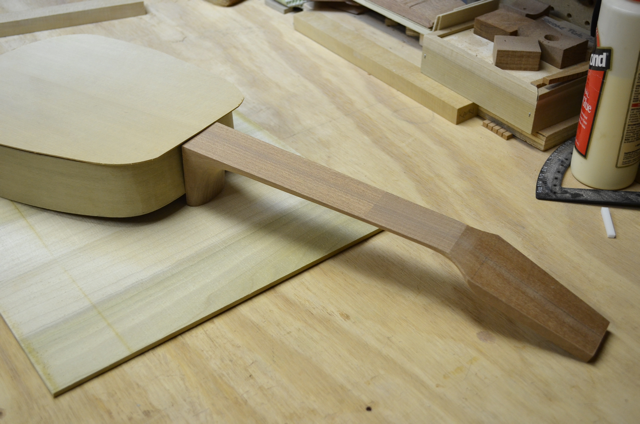 Ukulele Sakonnet is nearly ready for assembly. 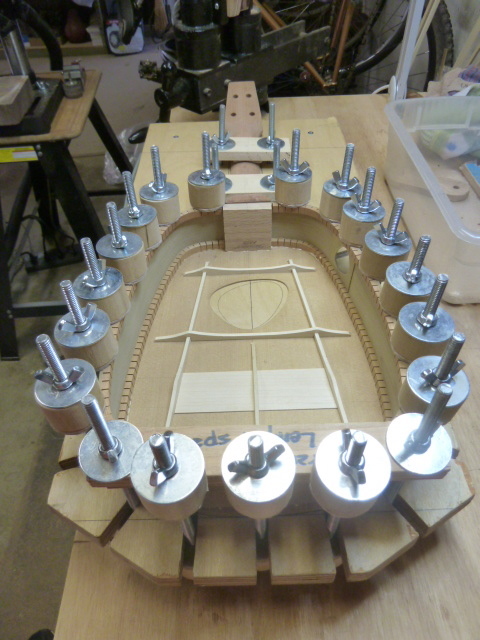 Her body is bent and kerfed, her neck is shaped, her sound- and back-boards are planed. She’ll soon be looking like an ukulele! 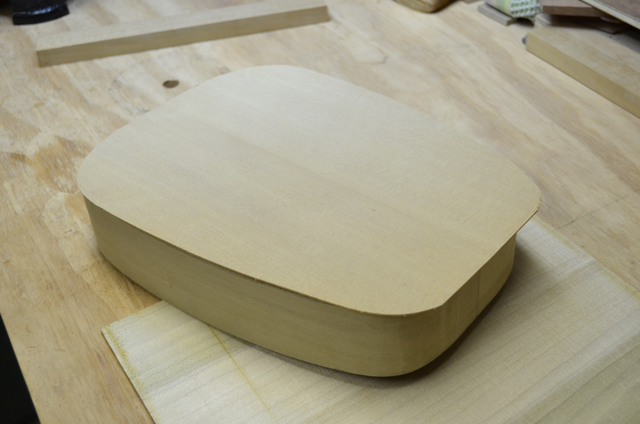 Her golden Kauri soundboard has a very understated appearance right now but this will turn a stunning golden yellow when finished. And Kauri wood has a sweet sweet sound! This will be the initial assembly. 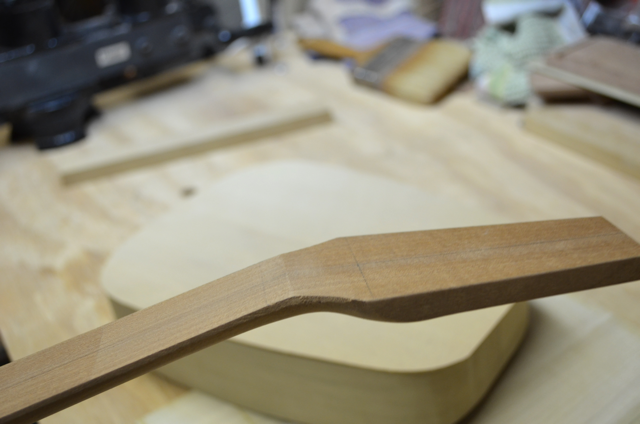 Neck goes on first and then the soundboard. Neck is 90% shaped at this point. Next we’ll drill out the tuner holes. 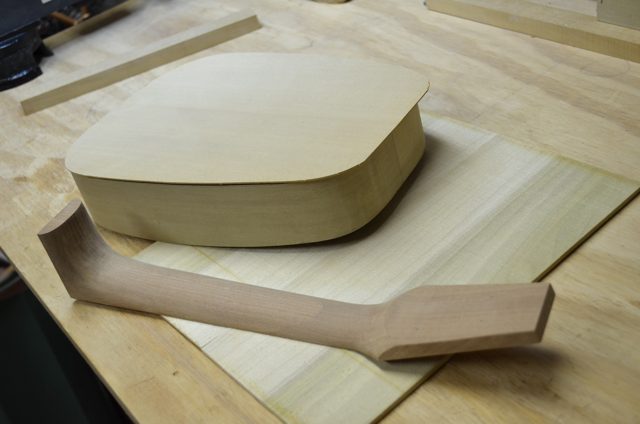 Ukulele “Sakonnet” ready for assembly. Showing Earl your photos! Your website gets better every week. Wow! I can see your ukes in the Smithsonian one day!